From one end of Montgomery County to the other, July 4th promises an incredible 238th birthday for the U.S. Considering our area&apos;s role in the quest for independence, it&apos;s no wonder that we take this holiday to heart and make it our own. Celebrate with us, and share your sparkle and fizz using the #MakeItMontco hashtag. The Pottstown July 4th Homecoming begins with a parade at Keim and High Streets at 10:15 a.m. What follows is two hours of fire trucks, vintage cars, veterans&apos; brigades, colorful floats and even the Roller Derby Rock Stars. The soundtrack is courtesy of variety of live marching bands, concert bands and even Celtic pipes. If you&apos;re looking for a shady spot to watch, try the sidewalk along The Hill School. Norristown&apos;s Independence Day includes the 6th Annual Celebration 5K Run on a course that winds through Norristown Farm Park. A parade then overtakes Airy and Swede Streets at 10:30 a.m., with marching sport teams, Boy Scouts, Girl Scouts, church groups, decorated vehicles, cartoon characters and maybe a superhero or two. During the day, admission to the Elmwood Park Zoo is a mere $4 for July 4th, leaving you in close proximity to ooh and aah over fireworks at nearby Elmwood Park. Skippack Village sends its Independence Day parade down Route 73, a road routinely used by General George Washington. The drumbeats and twirling begin at 11 a.m., leading off antique cars, bands, floats, Mummers, local officials and celebrities who toss candy and treats to the kids. Fire trucks occasionally mist the crowd with refreshing sprays of water. Parc Bistro holds a BBQ at 3 p.m., which should fortify you for fireworks at dusk in Palmer Park. 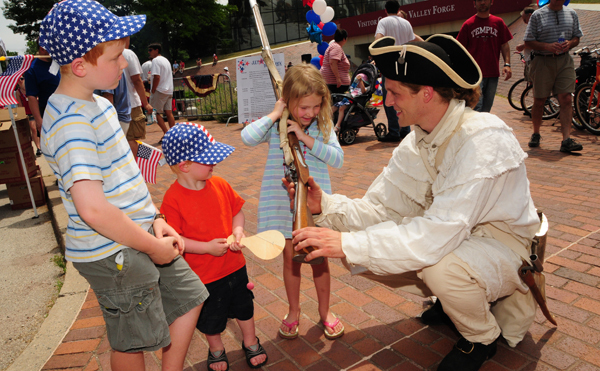 Valley Forge National Historical Park has a day full of commemoration, featuring artillery demonstrations, historical games, an all-American cook-out, music, Ranger-led walks, Trolley Tours, and a public reading of the Declaration of Independence. A rare copy of the Declaration will also be on display, and you can read our interview with its owner here. The community picnic - a rain or shine celebration - runs from 11 a.m. to 3 p.m. on the Visitors Center front lawn. Glenside/Abington has been throwing July 4th bashes for the past 111 years, making it one of the oldest in the area. The festivities, administered by the Greater Glenside Patriotic Association, begin at 10 a.m. with a children&apos;s bicycle decoration event at Harry Renninger Memorial Park. The granddaddy of all parades begins at 4 p.m. at Jenkintown and Edge Hill Roads, with dancers and music from myriad cultural backgrounds. After dark, 1,000 shells will colorfully explode over Abington High School&apos;s athletic fields. Conshohocken has one of the most unique traditions this time of year, a July 4th soap box derby race down Fayette Street. The first racers get the green flag at 8 a.m., and all reports show the competition starting as planned, with great hopes for dry weather. The threat of rain has, however, postponed the fireworks at Sutcliffe Park. They are now being shifted to Saturday, July 12, on the following itinerary: DJ, games, kids&apos; activities, etc. at 5:30 p.m.; fireworks at dusk (approximately 9:15 p.m.). 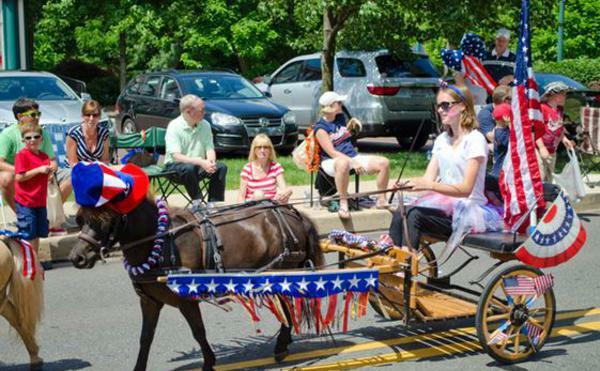 Narberth Park in Narberth is transformed into a July 4th carnival, with a baby parade that offers prizes in categories that include most cheerful and most patriotic. Games and races then take over, with a 1:30 p.m. start time for an old-fashioned pie-eating contest. Music accompanies the carnival-themed food like funnel cake and cotton candy. Once the sun is down, it&apos;s time for the rockets&apos; red glare. Waltz Golf Farm is using July 1-4 to celebrate its 50th anniversary as a family-fun hub. Over the four days, golfers can enjoy BoGo golf, and prices that roll back to 1964 rates, when mini golf can be played for 50 cents! 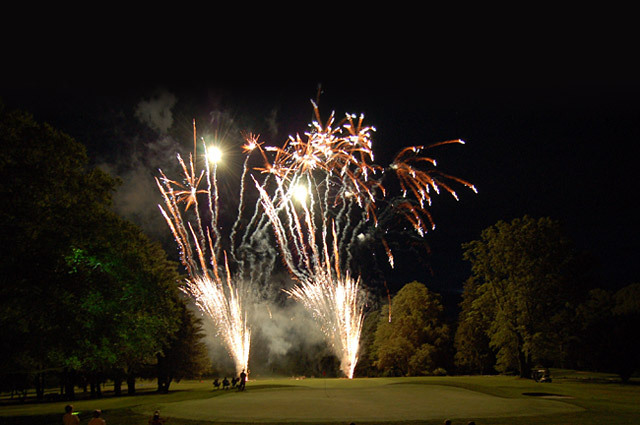 The Fourth features an all-day party of special music and food, an Elvis impersonator, birthday cake and a fireworks extravaganza that doubles the length of the usual show. We got a behind-the-scenes peek at this spectacle in Tuesday&apos;s edition of The Pursuit. Ambler Kiwanis Fourth, July 5, 2014, at dusk, Wissahickon High School Note: The July 5 date is a reschedule from the original date. The KiwanisClub carnival, however, will be held as scheduled, Thursday, July 3, and Friday, July 4. With July 4th falling on a Friday this year, the opportunity to escape the workweek for a three-day mini-vacation is going to be hard to resist. If your holiday has you seeking independence from ordinary menus, the kitchen at Ruth&apos;s Chris Steak House is always fired up. If you need accommodations - for either your own getaway or for visiting guests - the recommendations on our website should spark your interest.